While I was doing my usual training along Daang Hari on a Saturday morning, waving at my triathlon friends who had just finished theirs, a group of kids caught my eye. They were a rag tag team gathered under a shady tree. First they did some stretching, then some serious push-ups and sit-ups, after which they started running. After their run warm-up, the older boy, not more than 15 years old, started timing them one by one. Coach Noel and I were so impressed and so intrigued, we approached them and talked to them. It turned out that the leader of the group, a young boy named Joery Dela Pena, had organized them and was training them for a track event. Most of them ran barefoot or in rubber slippers. I realized that these kids were meant to be the new beneficiaries of Gabriel’s Symphony. Every year, we celebrate my son Gabriel’s life with a 12 hour event where friends come to run, bike, swim, walk, do a triathlon for the benefit of disadvantaged children. My son Gabriel, never reached his 1st birthday, he had multiple disabilities. He was perceived to be blind and deaf. My hope is that because he lived, no matter how short, his life would make a difference in the lives of other disadvantaged children. On Saturday, September 4, 2010, we will hold our 8th 12 hours in Memory of Gabriel. 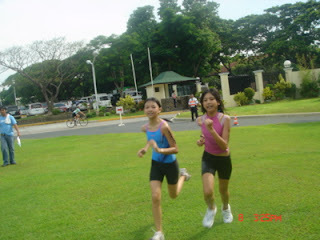 This year, we will include a program for these young runners. Through the generosity of our friends, Wayne and Stella Dearing and their company Top Draw Animation, the kids will be given lessons in animation and will take home their sketch pads and art materials. They will also be given basic Arnis lessons. We will also have running events lined up for them. Our sponsors, New Balance will be giving them shoes, Century Tuna, RFM and Gardenia – goodies to take home. Aside from these goodies, they will receive free vaccinations for Hepatitis A and B care of GlaxoSmithKline. After September 4, we hope to remain an active part in their young lives. We want to support their running, their education, give them a full life. If you want to make a difference in the lives of these kids or any of the other kids we help who have cleft lips, are hearing or visually impaired, let us know by sending us an email at [email protected] See you on Saturday. 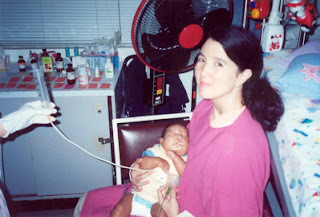 My son Gabriel lived for 9 months. Every September, we celebrate his short life with a 12 hour event in his memory. Friends come to run, walk, bike or do a triathlon. By doing this, our foundation, Gabriel’s Symphony Foundation, raises funds for kids who are disadvantaged either because of a disability, sickness or poverty. I like to think of it as a venue for families to have a day of fitness and fun while helping others. My own kids have done different things over the years. The first year, they actually biked and ran throughout the day stopping only to eat and rest. The succeeding years, they did the kids tri. This year, they both ran the 3k run with their friends. Anthony Pangilan and his son Donny won the Parent and Child buddy run (official results of all the events will be posted on Gabriel’s Symphony Foundation). 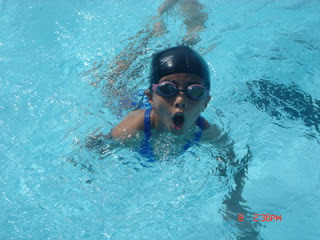 The kids triathlon and aquathlon was fun as always. 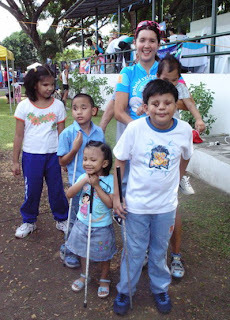 Coach Ani de Leon’s Super Kids, our future national triathletes were there in full force. Three year old Kira Ellis was our youngest participant (youtube video of super kids). 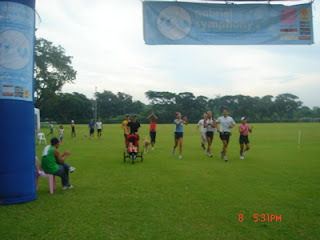 Fresh from the CamSur 70.3 Ironman, my tri-friends, organized themselves into groups to do an ironman relay. 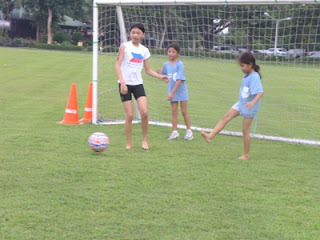 There were 12 teams in all, including two all girls teams called Little Twin Star and Hello Kitty! The Carpo sisters crossed the finish line with their teammates in colorful head gear and attire. Similarly, the sea princess, Tessa Prieto Valdes biked in her tutu. Inspired by all this, I told Ani and Mailet, we should have a best in costume award next year! Some of the visually impaired kids, beneficiaries of our Foundation were there too. They did a demo swim, which prompted me to tell their coach that they may want to train and participate in the aquathon next year. Later that morning they did a demo of table tennis specially designed for visually impaired individuals. We have donated 2 of these tables to blind schools and has committed to donate some more. We also forged a new tie-up with Carewell Community, a foundation dedicated to provide support for cancer patients and their families. We did a Carewell Bikes for Hope and raised funds both for Gabriel’s foundation and Carewell. And of course, my friend, Maiqui Dayrit, did his 5th ironman. Every year, he worries that he is not in shape. But regardless of the shape he is in, he does his 3.8k swim, 180k bike and 42k run. He is by far, the foundation’s, longest running, largest individual donor. God bless your heart and keep you healthy and running strong Maiqui! Ani Joey and Me with Maiqui after he finished his 5th Ironman distance. As Maiqui was finishing his run, my brothers and some friends on a whim, decided to do a 200 meter sprint. The arrangement was regardless of who wins, the group would donate to the foundation. The run lasted all of a few seconds but it was totally fun watching them. Then we came up with the idea of having my senate staff do the same 200 meter sprint. 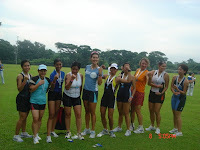 Some of the women in my office are quite fit… In fact, three of them Mich, Marvee and Karen did their first sprint triathlon relay in the UP College of Law Dean’s Cup a few weks ago. There was just too much that happened that day for me to be sad. I miss my son every day of my life. But so much goodness has come out of his short life. I thank everyone who has made this day memorable, for taking time to join us and for making a difference in the lives of children. Photo exhibits of kids the foundation has helped. I don’t recall suffering from jet lag as much as I am now. Its been more than a week since I got back from Ethiopia and my body clock is still off. Last Sunday, I ran the Greenfield 10k race on 1 hour sleep. That night, I slept soundly and after 7 hours of sleep, was able to train at 7 am. The next day however, I could not get out of bed! I skipped training all together. I laughed and said, “yes we are.” Truth is, we never stopped being triathletes. Though my last three major races were all marathons, we actually did our fair share of triathlons in 2008. Last July, Joey and I planned a trip to NY and looked for a race to join in the area. His sister lived in New Jersey. So did my cousins. Best of all, m my brother Lino was living in New York. We ended up doing the Rhode Island inaugural 70.3. The next week, I did NY tri with Lino. A few weeks later, Joey represented HSBC Philippines in the HSBC triathlon in London. 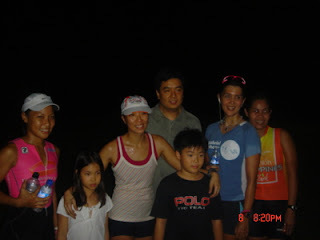 Then he did the 03 triathlon in Subic. I did the Olympic distance. 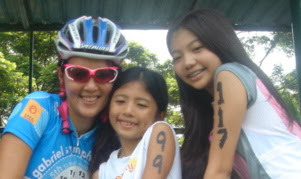 Ani de Leon, who completes our trio had her share of triathlons that year too. She did Ironman Langkawi in February where she qualified for a slot in Kona, the world championships. To prepare for Kona she also did the Singapore 70.3 and the 03 in Subic. Then she was off to Kona to fulfill her dream. Although I love doing tris, it definitely takes a lot of time to train for one. I have to plan my training schedule very carefully.. I need to plot and work in 3-4 sessions of running, biking and swimming, plus at least 1 yoga and 1 boxing session (boxing is our easy day/cross-training work-out). My training partner and I need to juggle work, parenting and other commitments throughout the week. And in my case, I need to be protective of the amount of back-to-back runs my legs can handle to avoid injuries.. And yes, I need my sleep. Although I always try to stick to the training plan, I sometimes alter the distance or intensity of the session, depending on the three factors above. If I suddenly have an early day, then we will just do a quick run or box for 45 minutes. What makes our ETT even more difficult to predict these days is the summer heat. I always fantasize about starting at day break..IF I could only get to bed early. But that rarely happens when you have a long day with lots on your mind, kids to take care of and work that you take home. So what’s a sleepytrigirl to do? Same thing, I’ve done the past few years. Kiss my kids goodnight and set my alarm; hit the snooze button a few times before I finally roll out of bed in the morning; text or reply to my partner that I’m awake or check that he is and down my oatmeal and vitamins before he walks in the door. Rain or shine, sleepy or wide awake, its time to train and be grateful for the gift of fitness.